Awareness iPhone app keeps cyclists in the all clear | What Hi-Fi? The app uses the microphone on the iPhone or iPod Touch to allow users "to listen to their music with total piece of mind, knowing that important sounds, warnings, shouts, sirens... won't be missed". Nobody wants to missing being shouted at but, in all seriousness, being able to hear what's going on around you above your music should surely be a no-brainer. 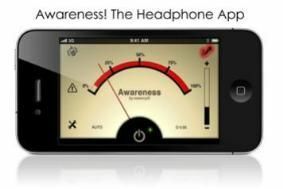 The app connects the microphone on the iPhone to the iPhone headphones and feeds the outside world into your music. You can set the mix yourself, allowing you to set the volume of your own music and also of the noise being allowed in to the earphones. The Awareness! app works with all headphones and earphones but does require iOS4.1. It's compatibel with the iPhone 4 and 3GS , plus the iPod Touch 4 and the iPod Touch 3 when partnered with a headset. The Awareness! app is by British iPhone developers Essency and is available now for £1.79. Check out the Essency website for more details.